I ended last week’s blog with a big mention for one of our young jockeys so this week I am going to start the blog with a mention for a couple more of our team. 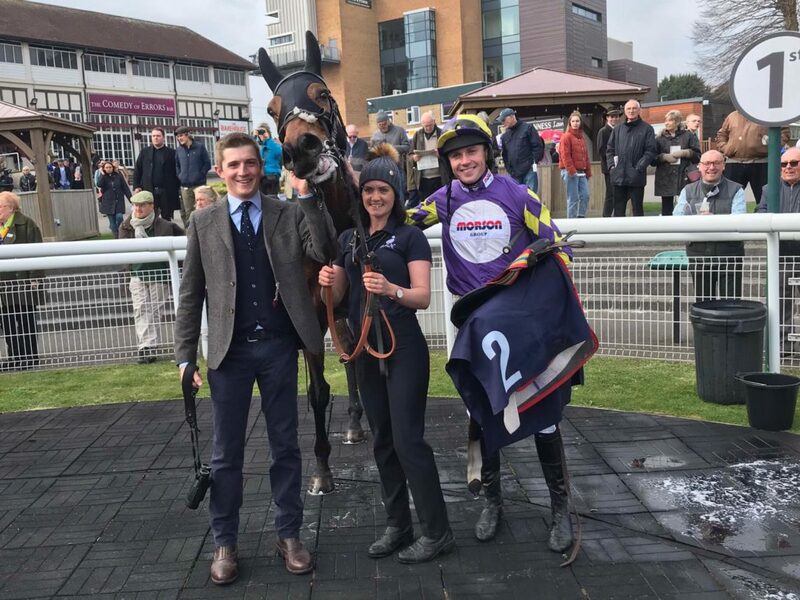 We have been lucky enough to enjoy another successful week with eight winners including two trebles at Fontwell and Wincanton, four of those winners being ridden by Lorcan Williams who had the biggest day of his career on Friday when riding his first treble winning on Captain Cattistock, Danse Idol and Romain De Senam. The thing I enjoyed most about Lorcan’s treble was at that very meeting two years ago he rode his first winner for us aboard Southfield Vic in the novice chase he won on Captain. Two years have gone by and in that time Lorcan’s riding has improved leaps and bounds. His confidence is currently sky high as he is riding some nice horses capable of winning and so long as he keeps his focus then he will continue to succeed. Lorcan is a good friend of mine and it has been very satisfying to see him enjoying some luck. The other jockey I am going to reference is Natalie Parker who rode Southfield Vic to success on Sunday at Wincanton and, although he was a short priced favourite, he did not win in that manner and Natalie had to work hard for the win. Nat is one of two pupil assistants in Ditcheat and has done a great job since joining us last summer. She is an extremely capable horsewoman and would be the first to admit her track riding is getting better all the time. I think what is great is that our stable jockey Harry, who has done quite brilliantly for us this season, is in regularly and if you are a young rider in an environment where Harry is riding out and Sam is coming in then you will only improve. Both Natalie and Lorcan have done really well this year and I have thoroughly enjoyed their success. Without much racing until Friday, it gave us a chance to do plenty of schooling through the week with one morning in particular proving very interesting. We are always bringing through the next batch of young horses and three we have recently purchased joined that list, they go by the name of Young Buck, Jeremy Pass and Bravemansgame, all bought at the Cheltenham festival sale. I quite like this time of year as we are receiving new horses all the time and I know Paul has always thought this is a great time to get them and the reason is this. Buying a horse at this stage in the season gives you some time to really get to know the horse and let them get to know your routine before their summer holidays. It serves as a taster month or six weeks in our yard. The new recruits get used to the bigger strings, work out the new gallops, become accustomed to a new diet all without the pressure of a looming race. The three horses that I mentioned have done just that, they joined our second yard, Highbridge, settled in perfectly and will do a few more weeks of training before we begin roughing them off. Paul always thinks that it gives them a great advantage for next season as they know all about our systems, gallops and way of life in Ditcheat. The three of them took to our outdoor arena really nicely and look like being nice horses next year. They will all have a nice summers grass now and I’d imagine will all start in bumpers in the autumn. While I spent the day at my favourite track Fontwell on Friday our annual trip up to Ayr was in full swing and made very much worthwhile with two winners in the shape of Getaway Trump and Secret Investor. I’ll deal with Trump first as I think this could be a horse next year who is going to be quite something; he a is big strong powerful gelding who I simply cannot wait to watch tackle fences. With some big races up at Ayr every year we always take the trip to the Scottish National meeting and, for us from down here, it is a very very long way indeed, so spare a thought for the team of guys that spend all the time in the lorry getting our horses up there. I have said it before in my blog, but travelling with the horses is no holiday. With no walkers at the races, if you are not caring for the horses you are probably leading them out for their leg stretch or riding them out. Work away from home with the horses is not easy and, any time we go away, the people that travel with our runners are very much the stars of these trips. From Kevin Parker, who drove the big lorry, to Michelle, Natalie and Frankie who went up to care for the horses and Kate Nutt our travelling head girl who, after a late night Saturday night, was up and on parade on Sunday morning for Wincanton. Paul is always saying how important his team is and there is never a truer word said, you cannot teach or pay someone enough to have high levels of dedication they either have it or they do not and we are lucky enough at Ditcheat to have many members of staff who regularly go beyond any call of duty. That to me is what makes a huge difference to Paul’s yard, good people who are very passionate about their work. While on the subject of Ayr, the Scottish track played host to my undoubted highlight of the week and that was of course Secret Investor who put in a brave front-running display to win the Grade Two future stars novices chase under an inspired Harry Cobden. Harry has really made a man of Seeky during his last two races and riding him positively from the front has seemed to bring about more improvement from him. It is yet another feather in Harry’s cap for getting these kinds of performances from him. I know I have professed my love for this horse before so I was very proud of him winning his second Grade Two of the season and he will now head for his holidays. Before I go I just want to thank one more person in this week’s blog and that is my old man, aka big Geoff, and I’ll tell you the reason behind that. At many charity auctions and plenty of other events, Paul often donates a morning on the gallops and stable tour of our yard, so throughout the season from very early autumn right up until now it is Dad who shows all of these people around. Every Thursday morning he is in the yard bright and early awaiting his guests for the day and generally the general feedback is that he does not do too bad a job! He would be the first to admit he would know more about Jurgen Klopp’s team than Paul’s squad and, having worked in insurance for the last couple of decades, he would never say he is an expert at the racing game, but he is a brilliant tour guide for the guests we have and I know Paul is grateful to him for doing it. I am aware this blog is a little like a bad song that just won’t end at this stage, but there is just one more thing before I promise I am done. Yesterday (Sunday) we welcomed 400 Owners’ Group visitors to our yard in a successful visit with a parade and burger van! I know, what an idea by Ryan Bliss, but the point I wanted to make was, and you will all be shocked to hear, I found a genuine fan of my blog. I regret to inform you I cannot tell you my new friend’s name, I think in the shock of meeting my new pal I forgot to ask, anyway the point of this story is this. What a moment, a racing fan, blog fan and fellow podcast fan, the day could quite literally not get better, hope you enjoyed the day my man and the Masters. Talking of podcasts there is a small chance a friend of mine and I are going to start one if we can find the time and enough subjects to talk about . . . I will tell you more about that in due course. In the meantime however, go well. I find it hard to believe yet another week has passed by and it is once again blog time, it seems that time is flying at the moment and, as we are under a month away from the end of the season, things in Ditcheat are slowly changing. Of course there is a lot of horses still in full training and working hard with some big spring targets to focus on, but now April is upon us some of the horses have finished their racing season and will begin the process of winding down before their summer holidays. You may think that as soon as our horses have finished racing we just finish them and they head out to the field, but in Ditcheat this is a timely process that Clifford and Paul do not rush. For an example, a lot of our young bumper horses that have now finished for the year will continue to canter probably for another three weeks. We do this for several reasons, one being that before they go for their summer holidays they will all have another schooling session so their jumping is fresh in their minds. The second reason being that Paul believes it is important to have your horses looking really well before they head to grass as if they look poor when they go out in the fields they will not do well while they are out. They get fed lots of haylage and plenty of feed with an ever-decreasing amount of rugs so that by the time they are heading out to grass they will have been without a rug in their stable for around two weeks. As I said this is a process that can’t be rushed, but Paul likes to ensure he is happy with their physical condition before turning them out to grass. This patience also makes certain that there is lots of good grass for them to eat when they do eventually head to the paddocks. For the horses still in full work, it has been business as usual and we had a couple of cool visitors on Monday with Nicky and Sophie Henderson watching first lot with Paul, before they headed to Seven Barrows to watch third lot at Nicky’s. Watching Paul and Nicky chat for an hour as first lot played out in front of them was absolutely fascinating. They obviously train their respective strings in very different ways, but both speak the same language in terms of their horses and what they need in order get the best out of them. I loved just standing by, watching them chat about racing, what they do with their horses, running plans, jockeys, schooling, the weather and just about everything in between. In terms of the National Hunt game there would not be many brains as good as those two when it comes to training racehorses. Obviously we are all just once again gathering our thoughts after a manic few days away up at Liverpool where Mcfabulous shone through as a top-class young prospect winning the Grade 2 bumper in determined fashion while a raft of other horses ran well in defeat. Clan Des Obeaux stayed on gamely to finish second in the Bowl as did Topofthegame and Politologue who put in an especially brave performance having bled during the Melling chase. Christopher Wood travelled really nicely in the Grade 1 juvenile hurdle and I’m sure he will have lots more good days over hurdles in his career. Christopher made his first mistake hurdling on Thursday which put him on the back foot, but he will have learnt a lot from that experience and I can see him winning a lovely two-mile handicap at some stage during his life with us. Away from Aintree, it was great to see the talented little thinker that is Birds of Prey win again at Taunton under what I thought was a really good ride from Lorcan Williams, who produced him at just the right time to win. My highlight of the week in terms of our horses though is a little bit of a left field one and that came at Chepstow in the shape of Is A Real Champ for the McNeil family. This huge son of Flemensfirth is a million miles from the finished article and I thought he showed plenty to like in his bumper. He is already a scopey jumper and, for a horse as weak as him, I thought he ran really very nicely indeed. He will go hurdling next season and, although my feeling is that he is not going to be anywhere near the top of his capabilities for a couple of seasons, this will certainly be a horse to follow over the next few seasons as he develops. I like him a lot. Looking ahead to this week we will be fairly quiet until Friday where we have some nice entries up at Ayr and again on Saturday with some really lovely horses targeted to venture north. Ayr in the spring is a location where Paul has always done well and I am hoping for more of the same this season with types like Ibis Du Rheu, Secret Investor, Getaway Trump and Magic Saint. The one I would be really looking forward too however at this stage is Imperial Cup winner Malaya, who has been targeted at this race for some time now. Bence, her regular rider, does an excellent job with her and he is delighted with how she is going. She looks in super condition with a great shine on her coat and is in peak physical condition. We have kept her fresh and I hope she will repay us with a bold show on Saturday. Before I go this week I just want to take you back to last Monday when Dr Sanderson won his third race this season, this time at Ludlow where, having jumped well and travelled remarkably strongly through the race, he ran out a smooth winner. That success confirmed he is a smart young horse, but the reason I want to highlight the victory was because of the man in the saddle, a young guy called Bryan Carver. Bryan joined us in the summer having spent a season with Will Biddick last year and has been a great asset to us since. A hugely popular guy in the yard, Bryan’s riding has got better and better this year so it was really special for us that he rode his first winner for us. Bryan is doing really well in the pointing field this year riding plenty of winners and, having caught the eye on a number of occasions, it was nice to see his hard work rewarded. I know Bryan’s eventual target is to join the professional ranks and with an attitude to match his excellent riding skills I would imagine you will hear a lot more from him. He also hits the golf ball a lot further than me which is annoying but everyone has to have a fault. That is about all from me, so I hope you have a good week and until we chat again, go well. I have been dying to tell you all about this past week for ages. The last few weeks have been particularly difficult as I have really wanted to let you in on our secret, but I was not permitted to! 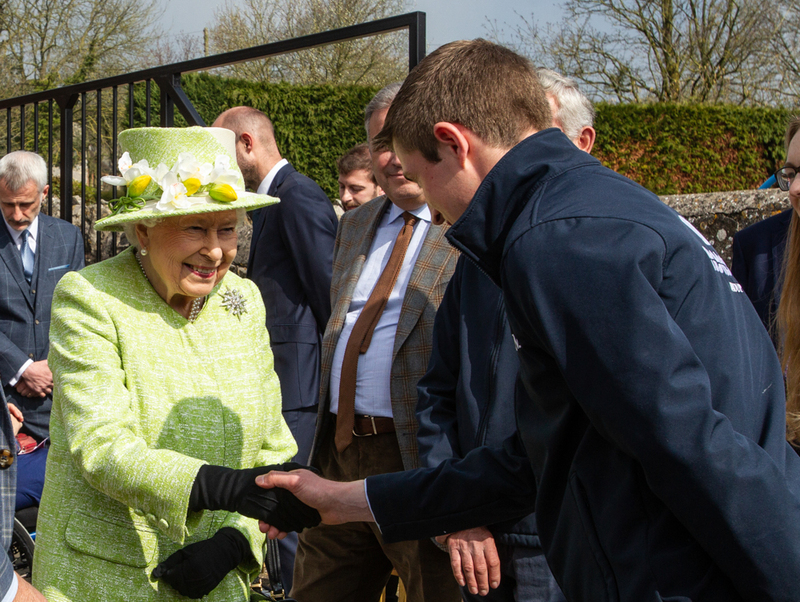 However, now the Royal visit has been completed, I can tell you all about what an absolutely incredible day it was on Thursday when we hosted Her Majesty the Queen at our yard. The mechanics of the visit began taking shape when Lina, our accounts manager, and Paul were holding secret meetings to plan everything and there has been a huge amount of work gone into in particular from Lina who alongside the palace and police force made the whole thing happen. The Queen was in Somerset and expressed an interest in coming to Paul’s yard and so the visit was arranged. To be honest, with the busy nature of our work I had not given it much thought up until the day when, as I arrived for work and saw the place teeming with police, I started to realise how much of a huge deal it was. The amount of thought, work and security that goes into the Queen visiting anywhere is massive and I quickly knew this was going to a special day. We rode out first lot and then the press started to arrive just as second lot was going out. A few radio interviews were conducted before security told us that our special guest would be five minutes so we organised ourselves one last time and awaited her arrival. The next half an hour went so quickly, but it was incredible. The Queen arrived in a huge Bentley and was introduced to Mr and Mrs Barber, Paul’s landlord, before meeting Paul, his mother and father and three daughters. Immediately after those initial greetings, our second lot came in from exercise and walked in the yard past Paul and our special vistor. We then paraded Clan Des Obeaux, Cyrname, Frodon, Mcfabulous, Politologue and Topofthegame and that was the part I enjoyed the most. Watching Paul and the Queen discussing each one of the horses and seeing her interest in them was fascinating and we walked the horses all around the yard, stood them up and then took them individually to meet her. Now I have lead and ridden Politologue all over the place, but I was so nervous as I pulled him out of his stable to parade for the Queen – “guey” like the others behaved beautifully and gratefully accepted the carrots she fed them. After the parade, the Queen met some members of the team including our farrier Tom, physio Teresa, Lina, Harry, Bryony, Clifford and me. What struck me the most was how knowledgeable about the whole industry she was – racing is clearly a big part of her life and it was incredible to have met her, a real once in a lifetime opportunity which I will never forget. Paul then had a final chat with our guest before she headed off to, as she said: ‘to do some work’. It was a day I will never forget, but the part that will stay most with me was watching the Queen and Paul stood in the middle of our yard just talking horses like they were just two racing fans, that was magic and I know Paul loved it too. Elsewhere this week we have slightly had a case of seconds, Coup De Pinceau ran a good race at Warwick to finish second, as did Scaramanga and Favorito Bucks at Ascot where they both ran nicely, but found one too good, albeit with Scaramanga not enjoying a huge amount of luck. I write this blog en route to Ludlow with Brian Carver on Monday morning, but before I headed off I was lucky enough to watch the Aintree chasers school which represented the perfect way to start the week. The horses all seem great and I am looking forward to seeing what they can all do in Liverpool. The only thing left to tell you all about is my highlight of the week and for those regular readers it will not take a scientist to work out what that was. For a couple of seasons now Secret Investor has been one of my absolute favourites in the yard. Although they are not important qualities in a racehorse, ‘Seeky’ is as kind and gentle a horse you would ever come across. He is a big boy and has to overcome plenty of niggles from day-to-day to keep the show on the road, but he is a wonderfully honest horse who made my week when he won at Wincanton. I thought Harry did a really great job on him as he rode him very positively, got him jumping and, in all truth, never looked like being beaten The manner in which he jumped and galloped home with his ears pricked was brilliant to see. It was great for Kate who looks after him and rides and who kept saying how well he was and that we needed to run him, so a big well done to her. That’s about it for this week, until next time, go well everyone.